I’m sharing my story with you to tell you how I was able to earn more than $50,000 in 12 months, which has allowed my wife and I to travel around the world. In the last 12 months, we have lived in Australia, Malaysia, Thailand, France and Indonesia. We could have visited many more places, but we chose to travel in those countries at a slower pace. The barrier that most people face when they want to enjoy a lifestyle like this is money. They earn an income doing their job, but they wonder how they can earn the same or more while they travel around the world. It sounds like it is an impossible dream, but I have been able to do it. And if I can do it, you can too! The amount that I have made isn’t staggering. 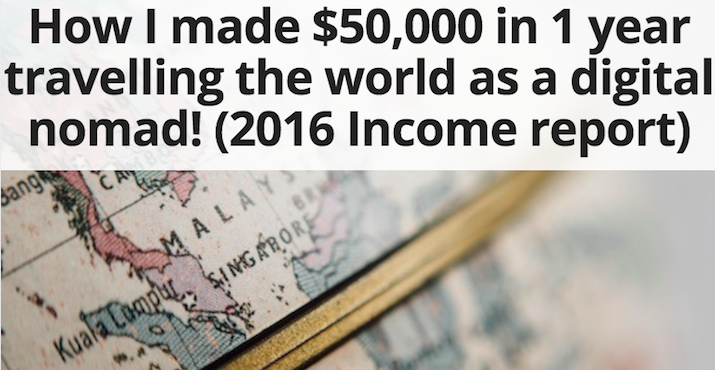 There are several other people that make much more money travelling around the world every year. In some cases, people are making this amount every month! In my case, I continually test different ways to earn an income. Generally, 20% of the activities that I do earn me the bulk of my income. Before I go into the details that you want to see, I want to let you know that I had experience in building a business before I started my life as a digital nomad. I also spent 6 months building up my earnings to a point where I felt confident to work from anywhere in the world. You don’t have to follow the exact path that I took. Ultimately, you need to develop a system that works for you. Here is a breakdown of the tasks that I was doing. This earned me the bulk of my income. I had secured copywriting projects with agencies and small to medium-sized businesses for writing articles and blog posts. You can learn how I did this with my digital nomad ebook. I was able to get this work by pitching for clients on Upwork. I successfully won a client on a one-year project. I won a project where I managed the Adwords account for a client for a few months. I have my own YouTube channels that I make an advertising income from. I have also shared a guide that talks about how you can make money with YouTube. I own shares in the Australian stock market and their dividends pay me around $200 every year. I use a buy and hold strategy. Each year, the company pays out a percentage of the profits to shareholders. I experimented with affiliate marketing, but was unsuccessful in generating sales. It is still a channel that I am working on. I earned an income from ad networks like Adsense, Sovrn and Media.net. But I haven’t been able to claim the money from all of the networks. It is possible to earn an income through advertising. Money aside, what was I able to do while I earned this income? The great thing about this lifestyle is the it allows you to be location independent. If you earn enough income, you will be able to have more time to enjoy your life the way that you want to enjoy it. Here are some of the highlights of the things that I was able to do while travelling as a digital nomad. Learned to surf in Bali. Made new friends while travelling. Met long-time friends while travelling. Danced all night at the Full Moon Party on the beach in Koh Phangan. Learned how to cook French food. Tried to learn basic Malay. Wined and dined in some of the most amazing bars overlooking the city. This is my story. You can create your story the way that you want to. I honestly think that if you can get yourself to a point where you are earning at least $24,000 a year, you will be able to live as a digital nomad successfully. If you would like to learn more, then sign up to our email list. If you have any thoughts or comments about how you can achieve this, let me know in the comments below. Should you start a YouTube channel to earn an income while you are travelling? You have probably heard about some of the success stories of people earning an income from YouTube while travelling. If you are into video recording or vlogging, this might be your calling. Building a successful YouTube channel is a bit like building a successful business. You need to have the right audience and monetization strategy that will allow you to earn an income for every video that you upload. The perk is that the video will continue to earn you an income in the future. How can you make money publishing videos on YouTube, while you are travelling? There are a few different ways you can earn an income. These include the following. Getting paid from an advertising network, such as Adsense. The quickest way to earn an income from YouTube is by partnering with an advertising network. Google Adsense is the most credible network (since they also own YouTube) and can share up to 30% of the advertising revenue with the content creators. You can apply for Google Adsense, however it is best that you also have a website setup and a complete profile uploaded on your YouTube channel. If you need a simple website, you can quickly set one up in a day by using the WordPress 1-click function. You can register a domain and webhosting here, which should cost you around $50 or less a year. Selling a product or a service on the back of the videos on your channel. This is something that alot of successful YouTubers do well. They build an engaged audience that is happy to purchase products or services from the brand that they have created. You could sell merchandise such as shirts, or hats. Alternatively, you could sell products such as books. This is a good way to start getting paid from your efforts on YouTube, but it is a bit more challenging. Affiliate income refers to getting paid a referral fee every time a person clicks a link from your platform. Referral fees can range from 1-70%. In order to use this successfully, you will need to get exposure to a large buying audience. These can be lucrative and if you can secure these types of partnerships over the long-tern, you could earn more than enough to sustain your travels over the long-term. The incentives don’t even have to be cash related. They could involve receiving discounts or even free travel, adventures or accommodation. There are some cases where people will donate funds towards your cause. This could be directly via Paypal or Crowdfunding. You’ve probably heard about some of the YouTube success stories like Pewdiepie, KSI and Zoella who have all become YouTube millionaires with legions of followers on their platform. The heart of their success comes from their audience and the content that they deliver to their audience. A great example to follow is Fun For Louis. His YouTube model upload works well for him and he receives sponsorship for his travel adventures, as well as income from YouTube that helps him pay for his travels. You can see his channel video below. Who should be your target audience? This is really a question that you need to answer. There are so many variables, such as your personality, your interests and passion. But one thing that is for sure is you know that you are a traveller. So to start with, you can start doing a travel channel and then tailor it to a micro-niche. For example, travelling as a married digital nomad in Bali? The more specific you can be, the better. Perhaps you will focus on street food or landmarks. Or perhaps you will make it a travel surfing channel. This depends on how your audience responds to the content that you produce. But what you should do is listen to their feedback and adjust your content so that you will continue to give them exactly what it is they want. For example, they might want to watch you react to certain street food during your travels. Or they might want to see you talk while visiting a new beach during your travels. How often should you upload? Your audience will want to consume content regularly. There’s been a growing trend with the most successful YouTubers uploading content everyday. If you plan to upload your content once a week, it is unlikely that you will be competitive enough to carve out your market on YouTube. How can I get my YouTube videos seen by more people? You will need to have a promotional strategy to maximise the amount of video views on your channel. This might involve promoting your videos on social media platforms such as Facebook and Twitter, as well as getting the video featured on blogs and web forums. Getting your video discovered on YouTube is incredibly important if you want to build an audience quickly. You can also follow this step-by-step guide that details exactly how to rank your video on YouTube and on Google. There is a theory that suggests that you can be successful if you have a loyal audience of 10,000 people. For example, if you sell merchandise such as t-shirts on your channel for a price of $10 each, and you have 10,000 sales, you will earn $100,000. 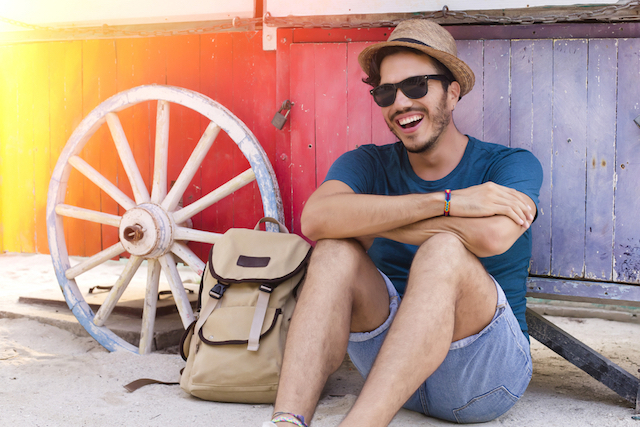 This is more than enough to support your solo travels for the year. The larger your engaged audience, the more success you will have with your efforts on YouTube. Even if you plan to make an income from the advertising income alone, you need to have a large audience that advertisers can display their ads to and then you will get a percentage of that income. What equipment do you need to get started? I honestly wish that someone would have just told me exactly what I needed to do to get started a few years ago. But hey, you live and you learn right? It isn’t worth jumping into this half-heartedly. If you want to succeed, you need to go all in. If you aren’t prepared to do it, then it is best that you just consider taking a holiday. Being a successful digital nomad means that you need to build a lifestyle. And just like building anything in life, you will need to build it from its foundation into something that you will be proud of. There are a few successful travel bloggers on YouTube, who have learned how to earn an income while travelling. iPhone 6, 6s or 7 cameras. If you want to travel light, then you can use the cameras on these phones which record in 720p on the iPhone 6 and in 1080p and 4K on the iPhone 7. You want to capture the perfect image quality and dream about the experience that they are sharing with you. Something to bear in mind is that the videos consume a lot of storage, so you will need to invest in a storage solution. Here are a couple of solutions that I’d recommend. Purchasing an iPhone with the highest storage capability (256GB). If you end up taking alot of videos, you will go through the storage quickly and you will need to download the videos onto external storage. If you need more storage in the future, you can invest in a cloud storage solution with Apple. Alternatively, I use a 1TB Seagate drive that I carry around with me as well for extra backup. NEVER, EVER RECORD VERTICALLY. It’s like an unspoken rule, but it really does impact the user experience. Don’t allow your audience to disengage due to this bad filming error. If you want a superior camera that has an excellent image quality, then you need to get the Sony G7x. I like it because it is small, portable, has a decent battery life and captures the professional image quality that I want. I personally think it has a slight edge over the iPhone, but it depends how many cameras you want to take. The autofocus and auto light adjustment is great on this camera. The only thing is if you plan to do alot of recording with this camera, you will need to purchase a second battery. The battery life goes for approximately 2h. Try to have 2 or 3 with you while you are travelling. If you end up going somewhere quite remote, it will be challenging to capture alot of amazing footage and have enough battery life left over. The other thing is you need to have a few memory cards to capture all of the footage. I wouldn’t recommend purchasing the cheapest memory card, but at the same time I wouldn’t say that you need to invest in the most expensive. You want an option that will capture the footage without delays or any glitches. I wouldn’t call it an essential, but it is definitely a nice to have. It depends what kind of videos you want to produce. If you are a person that likes doing activities, then a GoPro will probably be the right filming gadget for you. If you like surfing, riding a motorbike, skydiving or even cycling. You can get alot of footage, but the camera angles and lens might not give you the exact shots that you want it to. This probably isn’t the best camera to get started with if you are tight on funds, but it should be something that becomes a part of your toolkit in the future. Having a good stand is also important. But you don’t want to carry one that will add too much weight to your luggage or backpack. There are small tripods that you can invest in which should allow you to record vlogs and various types of footage. Drones can get you some amazing camera shots that you can use in your footage. It’s something that will allow you to capture amazing footage. But the drawback has been the size of these drones while travelling. Some of the main ones to consider include the following. I first saw the DJi Mavic Pro being reviewed by Casey Neistat. The thing that sold me on this drone was the video quality, control and it’s portability. It films up to 4K and can go up to a high altitude. Even though the Phantom drone is superior, its size makes it very inconvenient to carry. Probably the leading drone on the market. The Phantom 4 is the drone for the filming professional. Capture aerial views of the city you are in or 360 degree views of landmarks and its surrounding areas. The setback with this technology is the size. It will take up at least half of your luggage. It depends what filming shots you want to have. I was a PC loyal Microsoft Windows guy before. But it’s no lie that once you go Mac, you’ll never go back (for now anyway). As a digital nomad, your two most important pieces of equipment will be your smartphone and your computer. Your computer will be your remote office and will allow you to thrive as a digital nomad. MacBooks aren’t cheap. But buying a cheaper alternative will cost you more in the long-term. I will tell you why it is worth investing in a MacBook. If you can, invest in a Macbook Pro for video content. This is important as a traveller. Additional weight is a burden when travelling.The lighter, the better. The battery life is long. Depending on the model that you have, the battery life can last for over 9h.This allows you to be productive for longer no matter where you are. You can literally work on the beach for hours without worrying about going back for a recharge in the nearest cafe or hotel room. I can definitely say this about my Macbook Air. Within an hour, my laptop can be fully charged and then I can be on the go again. It’s syncing ability with other Apple and bluetooth devices is convenient. This is one of my favourite things about the MacBook. You can connect it to your phone with the firewire and USB cable, but you can also use Airdrop to transfer files via Bluetooth. You can also connect it to Apple TV, if you want to see things on the bigger screen. The programs that you can use to produce your work are amazing. Whether you want to publish videos, create images or develop websites, there are several software options that are ‘cutting edge’, allowing you to produce high-quality work. This comes with the MacBook and allows you to edit videos that have a pretty good quality. You won’t publish studio level short films, but it does the job and it is simple enough to use. It is a great entry-level option considering that it comes with the Macbook. This is the bad boy that you want as a part of your video editing arsenal. Majority of the pros on YouTube and in the film industry use the software to create compelling stories, editorial cuts, transitions and effects that will wow the audience. You must build an engaged audience! Whether you want to build a website, a YouTube channel, a huge Instagram account or whatever it might be, you must remember that your core objective will centre around the growth of your audience. The income that you will get from your lifestyle will come from business projects or opportunities that you can create. To create them, you must have an audience that is prepared to engage with you and your content in some way. After you’ve embarked on your travels with your YouTube videos, I want you to share your story in the comments section below. Share your YouTube channel, your story and any income success that you have had. I want you to be a part of the winner’s circle. Thanks for reading. I’m looking forward to hearing about your success soon. *Disclaimer – This post contains affiliate links. The recommendations are my own. Want to make money while travelling? Start a travel blog! You might be at a stage where you know you want to travel, but you have no idea how you can make an income. You might not even have anything that particularly interests you at this stage. That is fine. Alot of people have been in your position. So the first thing that I would recommend you doing is starting a travel blog. Ideally, you will be able to develop your travel blog to the point where it earns you an income residually. However, if it isn’t the case, I want you to use your travel blog to learn and develop skills that will allow you to earn an income by applying the skills that you will learn from doing a travel blog. In this post, I will share the steps that you should take to develop your travel blog. Promise yourself that you will commit to the development of your lifestyle and that you will figure out how to get it to work for you. There will be times when you will succeed and other times when you will fail. The thing to remember is that you will continue to build an income portfolio that will allow you to earn more than what you need to fulfil your travel dreams. Start a hosted WordPress site. This shouldn’t cost you more than $50USD for the year, but it will pay-off for itself in the long-run. You will need to invest in a web host solution that provides a 1-click WordPress install. You can click here to start the process. An alternative option is to use Hostgator. You can click on this link to get a 30% discount. Once you have setup your account, you will need to select a web theme design, name and configure the website. Note: By having your own site, you will develop the following skills. How can you start making an income from your travel blog? To succeed with making an income, you will need to find an audience that you can monetise. 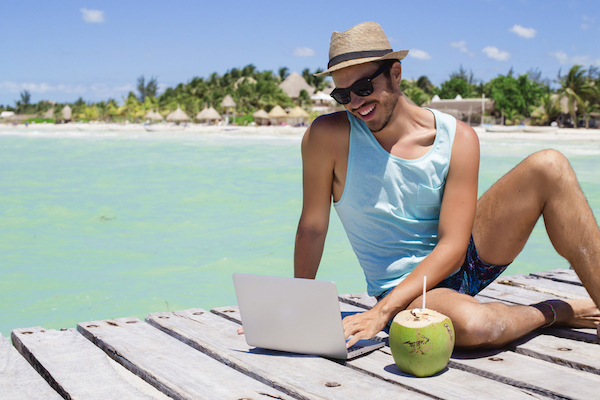 Here are some ways you can make an income from your travel blog. The easiest way to start making an income is by signing up to advertising networks who will display ads on your website. You will need to upload a code to your site to display the ads. Once this is done, you should receive an income credit for every time the ad is shown. The fee is usually credited as a cost per thousand impressions (Otherwise known as CPMs). You can also get paid with Pay per click ads. You can start earning an income on your website by partnering with the following advertising networks. Owned by Google. They allow you to publish ads in the form of display, text and video that blend into your website’s content. You can use Propeller ads to monetise your website. They work in a similar way to Adsense, however they tend to pay on a CPM basis (Cost per thousand impressions), which means you can get everytime someone visits and browses through your website. Owned by Yahoo, it works in a similar way to Adsense. However, the display ads only come in a few colours. When I first started to use it, it would earn a little bit of money, but over time, it hasn’t earned anything. You can try it to see if you will have more success with it. The thing I didn’t like about it was how much it impacted the visual experience of the website. I used this in the past and even though I have heard about other publishers having success with this ad network, I personally wasn’t a fan because it would never serve the ads. You can try it out and if some ads get served, then you will start to earn an income. But if not, then it will become a real problem. Affiliate marketing is another easy way to start monetising your audience. Everytime you make a recommendation for a product or service, you can get paid. If you do this for high-ticket items, you can earn a fair amount of income every month. Below are a few of the affiliate networks that you can sign-up to. The referral rate starts at 4%, but will increase up to 10% when you make more referral sales. One of the ‘big 3’ affiliate companies, you can implement start promoting products and getting a referral free for leads and sales. Commission Junction is the biggest affiliate and they work with major brands. Working with them can be lucrative over the long-run, however it can be challenging to get accepted in their programs. Another one of the big 3 affiliates, there are several affiliate products that pay high commissions, however many of the products are unknown. You will need to do your research to learn more about what they offer. Many people have had success with ShareAsale’s affiliate program. They have their own, where you will earn a commission for referring people as leads to their site. But they have several businesses whose products you can promote. It can be an easy way to start generating an online income. Click here to join the affiliate program now. You can create and sell your products online. If you have enough visitors to your site, you can sell products such as your own merchandise or an information course. This is actually a scalable way for you to increase your income and even earn an income residually over the long-term. One of the quickest ways to earn an income is by selling any skills that you can provide. This could be anything. You could start writing, you could manage a website, you could provide voiceovers. It is really up to you. But whatever you decide to sell, make sure that you can do it really well. You can find jobs for freelancers, digital nomads or remote working opportunities here. This is a big income earner, however there is a catch. There are several businesses (especially SEO companies) that are willing to pay a fee in exchange for getting a post published with a link going back to their client’s website. Many travel bloggers can earn hundreds or thousands of dollars each month with this practice. The reason that this is being done is to manipulate Google’s search engine results. The backlash is that it could affect your website in the future. You should read Google’s Terms of Service to see what they advise when it comes to sponsored posts. Sell advertising on your website. If you get enough visitors to your site, you can start to sell ads. Some people earn hundreds or even thousands of dollars every month simply by selling ad space units on their website. These aren’t the only ways you can make an income through your website, but it should point you in the right direction and hopefully, you will start to make your first dollars to sustain your digital nomad journey and create a ticket for endless travel. If you have seen some other creative ways for people to start earning an income with their travel blog, then leave a comment in the section below. Disclaimer – This post contains affiliate links, but the opinions and recommendations are my own.